The Bessemer process was the first inexpensive industrial process for the mass-production of steel from molten pig iron. The process is named after its inventor, Henry Bessemer, who took out a patent on the process in 1855. The process was independently discovered in 1851 by William Kelly. The process had also been used outside of Europe for hundreds of years, but not on an industrial scale. The key principle is removal of impurities from the iron by oxidation with air being blown through the molten iron. The oxidation also raises the temperature of the iron mass and keeps it molten. The process is carried on in a large ovoid steel container lined with clay or dolomite called the Bessemer converter. The capacity of a converter was from 8 to 30 tons of molten iron with a usual charge being around 15 tons. At the top of the converter is an opening, usually tilted to the side relative to the body of the vessel, through which the iron is introduced and the finished product removed. The bottom is perforated with a number of channels called tuyères through which air is forced into the converter. 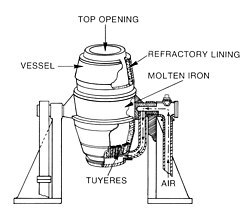 The converter is pivoted on trunnions so that it can be rotated to receive the charge, turned upright during conversion, and then rotated again for pouring out the molten steel at the end. The oxidation process removes impurities such as silicon, manganese, and carbon as oxides. These oxides either escape as gas or form a solid slag. The refractory lining of the converter also plays a role in the conversion—the clay lining is used in the acid Bessemer, in which there is low phosphorus in the raw material. Dolomite is used when the phosphorus content is high in the basic Bessemer (limestone or magnesite linings are also sometimes used instead of dolomite)—this is also known as a Gilchrist-Thomas converter, named after its inventor, Sidney Gilchrist Thomas. In order to give the steel the desired properties, other substances could be added to the molten steel when conversion was complete, such as spiegeleisen (an iron-carbon-manganese alloy). When the required steel had been formed, it was poured out into ladles and then transferred into moulds and the lighter slag is left behind. The conversion process called the "blow" was completed in around twenty minutes. During this period the progress of the oxidation of the impurities was judged by the appearance of the flame issuing from the mouth of the converter: the modern use of photoelectric methods of recording the characteristics of the flame has greatly aided the blower in controlling the final quality of the product. After the blow, the liquid metal was recarburized to the desired point and other alloying materials are added, depending on the desired product. Before the Bessemer process Britain had no practical method of reducing the carbon content of pig iron. Steel was manufactured by the reverse process of adding carbon to carbon-free wrought iron, usually imported from Sweden . The manufacturing process, called cementation process, consisted of heating bars of wrought iron together with charcoal for periods of up to a week in a long stone box. This produced blister steel. Up to 3 tons of expensive coke was burnt for each ton of steel produced. Such steel when rolled into bars was sold at £50 to £60 a long ton. The most difficult and work-intensive part of the process, however, was the production of wrought iron done in finery forges in Sweden. This process was refined in the 1700s with the introduction of Benjamin Huntsman's crucible steel-making technique, which added an additional three hours firing time and required additional large quantities of coke. In making crucible steel the blister steel bars were broken into pieces and melted in small crucibles each containing 20 kg or so. This produced higher quality crucible steel but increased the cost. The Bessemer process reduced to about half an hour the time needed to make steel of this quality while requiring only the coke needed to melt the pig iron initially. The earliest Bessemer converters produced steel for £7 a long ton, although it initially sold for around £40 a ton. Bessemer converter, Kelham Island Museum, Sheffield, England (2002). Historian Robert Hartwell points out that the 11th century Chinese of the Song Dynasty innovated a "partial decarbonization" method of repeated forging of cast iron under a cold blast. The historians Joseph Needham and Wertime acknowledged that this was the predecessor to the Bessemer process of making steel. This process was first described by the prolific scholar and polymath government official Shen Kuo (1031–1095) in 1075 when he visited Cizhou. Hartwell states that perhaps the earliest center where this was practiced was the great iron-production district along the Henan -Hebei border during the 11th century. In 1740 Benjamin Huntsman developed the crucible technique for steel manufacture, at his workshop in the district of Handsworth in Sheffield . This process had an enormous impact on the quantity and quality of steel production. Henry Bessemer described the origin of his invention in Chapters 10 and 11 of his autobiography. 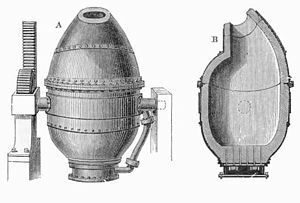 According to this book at the time of the outbreak of the Crimean War many English industrialists and inventors became interested in military technology and Bessemer himself developed a method for grooving artillery projectiles so that they could spin without the use of rifling in the bore of the gun. He patented this method in 1854 and began developing it in conjunction with the government of France. After a successful day of testing of his method at the Polygon in France he had a conversation with Claude-Etienne Minié who stated that a key barrier to the use of the larger, heavier spinning projectiles would be the strength of the gun and in particular "...he [Minié] did not consider it safe in practice to fire a 30-lb. shot from a 12-pounder cast-iron gun. The real question, he said, was; Could any guns be made to stand such heavy projectiles?". This is what started Bessemer thinking about steel. At the time steel was difficult and expensive to make and was consequently used in only small items like cutlery and tools. Starting in January 1855 he began working on a way to produce steel in the massive quantities required for artillery and by October he filed his first patent related to the Bessemer process. According to his autobiography Bessemer first started working with an ordinary reverbatory furnace but during a test a couple of pig ingots got off to the side of ladle and were sitting above it in the hot air of the furnace. When Bessemer went to push them into the ladle he found that they were steel shells: the hot air alone had converted the outer parts of the ingots to steel. This crucial discovery led him to completely redesign his furnace so that it would force high-pressure air through the molten iron using special air pumps. Intuitively this would seem to be folly because it would cool the iron, but due to exothermic oxidation both the silicon and carbon react with the excess oxygen leaving the surrounding molten iron even hotter, facilitating the conversion to steel. Bessemer licenced the patent for his process to five ironmasters, for a total of £27,000, but the licences failed to produce the quality of steel he had promised and he later bought them back for £32,500. He realised the problem was due to impurities in the iron and concluded that the solution lay in knowing when to turn off the flow of air in his process; so that the impurities had been burnt off, but just the right amount of carbon remained. However, despite spending tens of thousands of pounds on experiments, he could not find the answer. The simple, but elegant, solution was first discovered by Robert Forester Mushet, who had carried out thousands of scientifically valid experiments in the Forest of Dean . His method was to first burn off, as far as possible, all the impurities and carbon, then reintroduce carbon and manganese by adding an exact amount of spiegeleisen. This had the effect of improving the quality of the finished product, increasing its malleability - its ability to withstand rolling and forging at high temperatures and making it more suitable for a vast array of uses. The first Bessemer steel mill in the United States was established in 1855 in Wyandotte , Michigan , on the Detroit River, about 14 miles south of Detroit . Detroit became an early steel producing city in North America due to easy access to Great Lakes shipping and iron ore from northern Michigan, Wisconsin and Minnesota . These were major factors in development of Detroit as a renowned center of automobile manufacture. The Bessemer process revolutionised steel manufacture by decreasing its cost, from £40 per long ton to £6-7 per long ton during its introduction, along with greatly increasing the scale and speed of production of this vital raw material. The process also decreased the labor requirements for steel-making. Prior to its introduction, steel was far too expensive to make bridges or the framework for buildings and thus wrought iron had been used throughout the Industrial Revolution. After the introduction of the Bessemer process, steel and wrought iron became similarly priced, and most manufacturers turned to steel. The availability of cheap steel allowed large bridges to be built and enabled the construction of railroads, skyscrapers, and large ships. Other important steel products—also made using the open hearth process—were steel cable, steel rod and sheet steel which enabled large, high-pressure boilers and high-tensile strength steel for machinery which enabled much more powerful engines, gears and axles than were possible previously. With large amounts of steel it became possible to build much more powerful guns and carriages, tanks, armoured fighting vehicles and aircraft carriers. Industrial steel also made possible the building of giant turbines and generators thus making the to harnessing of water and steam power possible. The introduction of the large scale steel production process perfected by the Englishman Henry Bessemer paved the way to mass industrialisation as observed in the 19th-20th Centuries. In the U.S., commercial steel production using this method stopped in 1968. It was replaced by processes such as the basic oxygen process, which offered better control of final chemistry. The Bessemer process was so fast (10–20 minutes for a heat) that it allowed little time for chemical analysis or adjustment of the alloying elements in the steel. Bessemer converters did not remove phosphorus efficiently from the molten steel; as low-phosphorus ores became more expensive, conversion costs increased. The process permitted only limited amount of scrap steel to be charged, further increasing costs, especially when scrap was inexpensive. Use of electric arc furnace technology competed favourably with the Bessemer process resulting in its obsolescence. Certain grades of steel are sensitive to the 78% nitrogen which was part of the air blast passing through the steel. R. B. Prosser, "Mushet, Robert Forester", Oxford Dictionary of National Biography, Sidney Lee, ed. (1894), pp. 430-432. On line. The Engineer, 15 August 1856. Bessemer's explanation of his process.